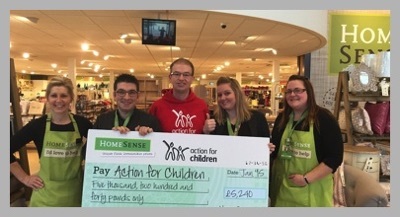 Leading homeware retailer HomeSense has raised more than £5,200 for Action for Children’s North Somerset Short Breaks and Bristol Supporting Families services for children and young people. Customers at HomeSense Bristol store in Imperial Park, Wills Way were asked to make a donation to Action for Children in exchange for a Christmas bauble, on which they could write a festive message or childhood Christmas memory before hanging it on a special HomeSense Christmas tree in the store. The campaign raised an impressive £5,240 in Bristol for the charity’s North Somerset Short Breaks and Bristol Supporting Families services. North Somerset Short Breaks provides residential holiday breaks for children and young people who are between the ages of five and 18 who have a physical or learning disability. Bristol Supporting Families has a skilled, experienced family support team, therapeutic practitioners and volunteers who work with families to help them reduce identified risks and overcome specific barriers.